China Southern Airlines has announced that it will launch a freighter service linking Guangzhou with Ho Chi Minh City and the Vietnamese capital Hanoi on September 24. 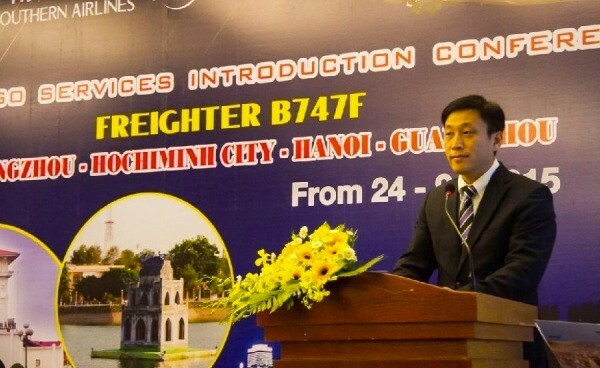 General Manager Vietnam of China Southern Airlines Cui Heng, announces the new freighter link. ´The freighter service will operate four times a week, on Monday, Thursday, Saturday and Sunday, using Boeing-747Fs. A China Southern spokesman said that cargo will mainly consist of shoes, clothes, fruits and vegetables. It is the carrier’s first freighter service to Vietnam. In another development, China Southern has introduced its cross-border e-commerce platform - Southern Cross-Border Purchase (http://csairshop.com), through which customers can purchase goods on-line in overseas markets, including the U.S., Japan, Australia and New Zealand and ship them on the carrier’s global network to China. Since January 2015, China Southern’s cargo department has been working with cross-border e-commerce operators and overseas producers and suppliers to create B2C procedures and develop transport channels. Currently, its cross-border e-commerce business covers 13 international destinations, including among others Los Angeles, Vancouver, New York, Auckland, Tokyo and Frankfurt. In January-July 2015, China Southern carried more than 1,500 tonnes of cross-border packages.